One of the things I'm sure many moms can agree on is that we never take enough for ourselves. We are constantly trying to shuttle kids around, cook, clean, tackling mountains of laundry, and we tend to feel frazzled by dinnertime. Going to a spa sounds like a great idea, but the reality is that it's just not doable for most of us. Besides the cost involved, there is that time issue. Well why not bring the spa home to you? By having some simple items, you can feel pampered and relaxed without stepping foot outside of your home. The Home Spa Treatment System by Instrumental Beauty is a great first step. This amazing tool is a 4-in-1 and is made for your body, face and feet. It has 4 attachment heads that include an over-sized rotary brush for the body, smaller one for face, a micro-dermabrasion sponge and a pedi smoothing stone. This tool come with 4 AA batteries and packs a lot of power. It is a great way to feel like you had a mini spa session. It scrubs away dead skin to reveal your natural glow and to restore smoothness. I keep mine on the side of my tub for daily use, because why not! This home spa system can be purchased for only $30. I know you or someone you love is worth that. I'm sure you will not get any type of spa service for that price. Also to go along with your spa system, you need a good bath and shower gel. 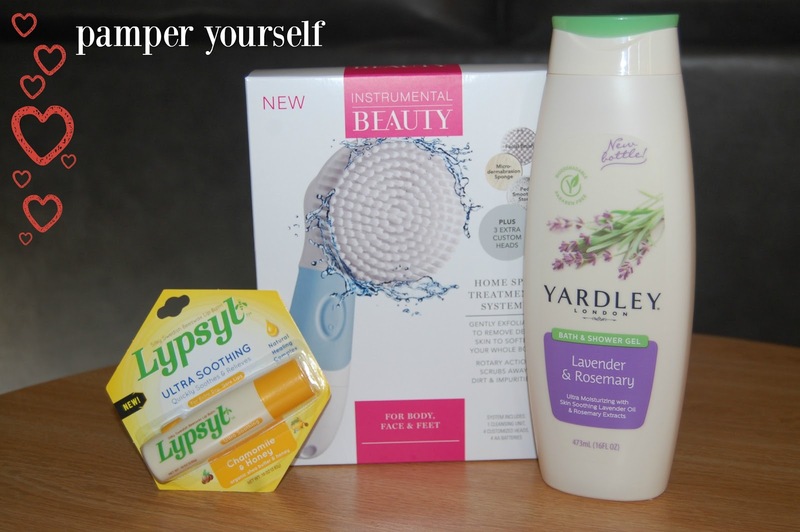 The Yardley Lavender and Rosemary is perfect! It is made with lavender essential oil and will calm your senses. At only $4.99, it's a great value. Definitely way less than the boutique brands, and just as effective. It's available at Walgreens, Rite-Aid, Publix and more. Make sure you don't forget your lips. Yes, even your lips should be pampered. Lypsyl Ultra Soothing lip balm is a simple way to make your lips kissably soft and smooth. Formulated from all-natural, pure Swedish beeswax, and a combination of natural and therapeutic ingredients like organic Shea butter, coconut oil, Vitamin E and Vitamin A, Lypsyl provides unsurpassed moisture and lip protection. It’s only $2.99 and comes in Chamomile & Honey or Original Mint. You can purchase it at Wal-Mart, Walgreens, Rite-Aid and other retailers nationwide. These items would make a great gift for Valentine's Day or as a just because gift. I'm thinking ahead of Mother's Day as well. Don't forget your co-workers, moms, sisters, girlfriends, teachers and YOURSELF! I received product samples in exchange for an honest review. All opinions are 100% my own as always.